soak the tamarind in a little warm water for 5 minutes. extract the juice, discard the seeds and keep the tamarind water aside. heat oil in a wok [ kadai ]. when hot add mustard seeds. when these splutter, add cumin seeds, urud dhal, lupenta splits and sauté till lupenta turns a light tan colour. add moong dhal, dry red chillies, curry leaves and hing. Sauté till aroma of chillies and moong dhal is released. add ginger and tomato. Cook till tomatoes soften. add coconut and toss till well mixed. when mix is cool, place in a blender or grinder. add tamarind water and grind. Texture: thick smooth paste. Well ground chutney does have a better flavour. In winter, it can be warmed lightly. on very hot days, keep in the fridge till ready to serve. 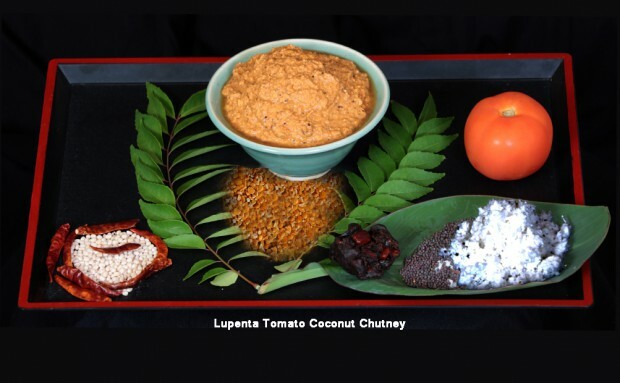 serve as accompaniment to Adai or Dosai. serve as dip on a bed of non sour yoghurt or swirl yoghurt through the chutney. mix chutney through cooked pasta. Storage : will keep in the fridge for 2-3 days. Coconut will ‘spoil’, do not store chutney for longer than this. looses its flavour when frozen. Add 1-2 fresh red chillies or substitute for some dry chillies. The fresh red chillies can be roasted with the dry ones or ground raw. There is a subtle taste difference, but equally delicious. Roasting the lentil and coconut to a deeper colour does add depth to the flavour but avoid burning any ingredient. Sauté onions with the chillies. This adds depth to the recipe. reduce the proportions of lupin and increase moong dhal. soak the lupin splits for 3-4 hours, discard the water. Rinse, drain and dry the splits before adding to the oil. hing, ginger, garlic help digest lentils. Serve with plain non sour yoghurt.